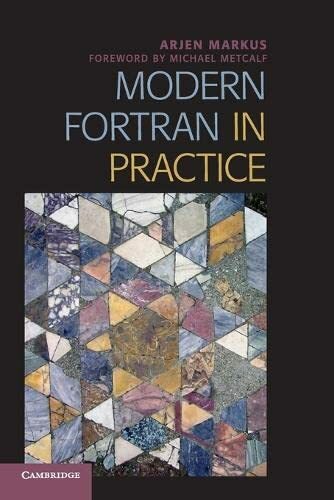 [PDF] Modern Fortran in Practice | Free eBooks Download - EBOOKEE! Description: From its earliest days, the Fortran programming language has been designed with computing efficiency in mind. The latest standard, Fortran 2008, incorporates a host of modern features, including object-orientation, array operations, user-defined types, and provisions for parallel computing. This tutorial guide shows Fortran programmers how to apply these features in twenty-first-century style: modular, concise, object-oriented, and resource-efficient, using multiple processors. It offers practical real-world examples of interfacing to C, memory management, graphics and GUIs, and parallel computing using MPI, OpenMP, and coarrays. The author also analyzes several numerical algorithms and their implementations and illustrates the use of several open source libraries. Full source code for the examples is available on the book's Web site. No comments for "[PDF] Modern Fortran in Practice".